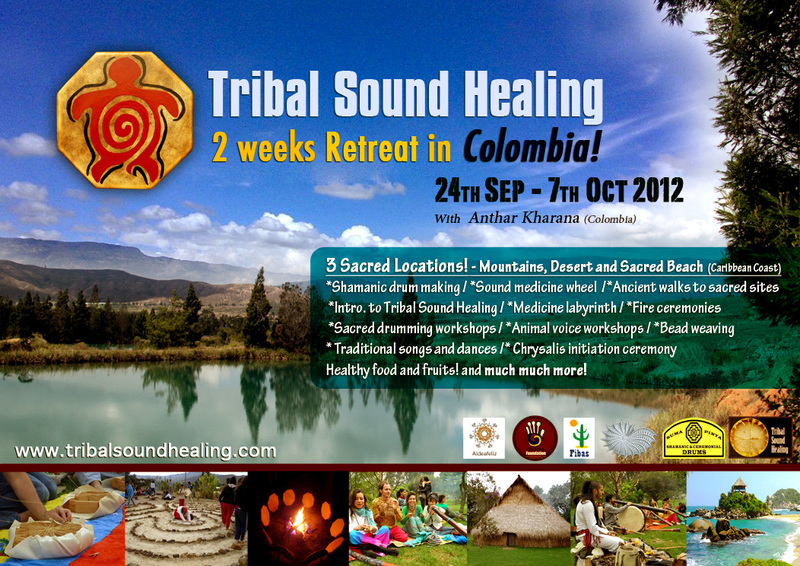 Tribal Sound Healing Retreat in Colombia 2014! we are getting ready for our 2014 one! This 2 week Tribal sound healing retreat will take you on a journey to the second most ecologically diverse country in the world, Colombia! You will be immersed into this beautiful land in three different locations, which will include the Andean mountains, deserts in the centre of the country and a sacred beach in a paradise with warm, blue seas and a jungle on the caribbean coast. *Making your own shamanic drum and blessing ceremony. *The sound medicine wheel and teachings. *Sacred walks and treks to ancient and sacred sites. * Recreational tours and visit to different sites of Colombia. The first week the journey will be in two locations. The first location will be a magical land in an eco-village in the middle of the Andean mountains with warm, wonderful weather, a river passing by and a ceremonial house, as well as a great family of light workers and permaculturist, offering everyone an unforgettable life experience as well as being the home for the different workshops and teachings that will be held on this land. Accommodation will be in eco-houses built by the same people of the village with wide views of the green and fresh vegetation of the mountains and surroundings. Healthy food included. You will stay on a beautiful traditional retreat house surrounded by a little river and massive mountains right on the heart of Villa de Leyva, an exhilarating town that you will never forget! Healthy food included. This retreat will be lead by Colombian Sound Therapist/Practitioner, world music artist and musician, Anthar Kharana, Anthar is also the founder of Tribal Sound Healing in Bristol, United Kingdom, and the charity The Tambora Foundation for children in Colombia and the UK. The retreat will be supported by the honourable Elders from different territories in Colombia.They will be sharing their wisdom with us. We will also be joined by professionals and practitioners of different areas of healing, cultural work and permaculture. Full Payment required by 1st of September 2012 -* Cancellation refunds can only be given after that date if we manage to fill your place.